Participants were purified in water before scrambling to find sticks that had been thrown into the crowd. 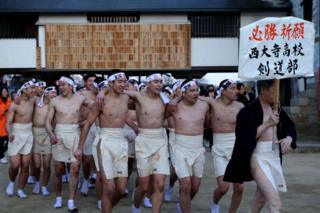 Those who found the 20cm-long sticks, called "shingi", are believed to be the luckiest men of the year. This was the 510th anniversary of the Saidaiji-eyo festival, which dates back to the Muromachi period of Japanese history. It kicked off with the thousands of participants bathing in cold water in the Yoshii river, in order to purify them before they hunted for the shingi. Then at about 22:00, once the purification stage was complete, the lights were turned off. The temple's chief priest stood at a window four metres high and threw the two shingi into the crowd. A mass jostle ensued and for the following two hours the crowd of men pushed and felt around for the sacred sticks. The pair who left the temple grounds holding the sticks were crowned the lucky winners. Saidaiji-eye is one of the highlights of the Japanese traditional festival calendar. Aside from the luck the shingi bring, it is also a fertility festival that is thought to bring good harvests in for the rest of the year. It usually falls at about the same time as the Lunar New Year. Thousands of other people go to the temple to light lanterns, and watch the men compete for the shingi.